Sometimes I buy ingredients with no real idea of how I’m going to use them. Sometimes they sit around for a good long time, like the Chermoula I brought back from London, or the drinking chocolate I just couldn’t resist. But these things have a long shelf-life, unlike the ruby red prosciutto bits I fell in love with a few days ago. I could have frozen them, but my freezer is already stuffed with things like nice bacon I bought on a whim, Sabella’s ravioli boxes, and exorbitantly expensive chocolate that I found on super sale. No, I needed to eat this prosciutto. 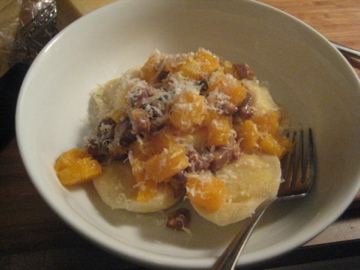 I poked around a bit online and found some recipes for Ravioli with Prosciutto and Butternut Squash- this would help me use up some Sabella’s (not that I need an excuse) and, hopefully, be a meal nice enough to serve a good friend coming to dinner. Below, the recipe I ended up creating. Melt butter over medium high heat, add prosciutto and squash. Heat water for ravioli so they can cook while you are finishing your sauce. 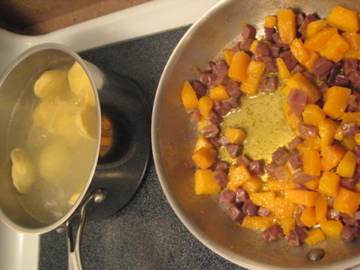 Saute squash and prosciutto, stirring occasionally, over medium heat until squash is tender but firm, about 10-15 minutes. 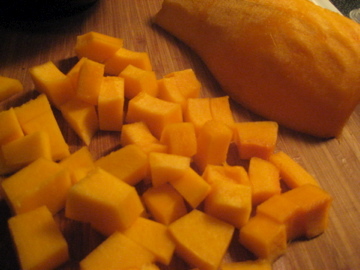 Add sage leaves to squash mixture for the last 1-2 minutes of cooking. Drain ravioli, top with squash mixture and grated parm.